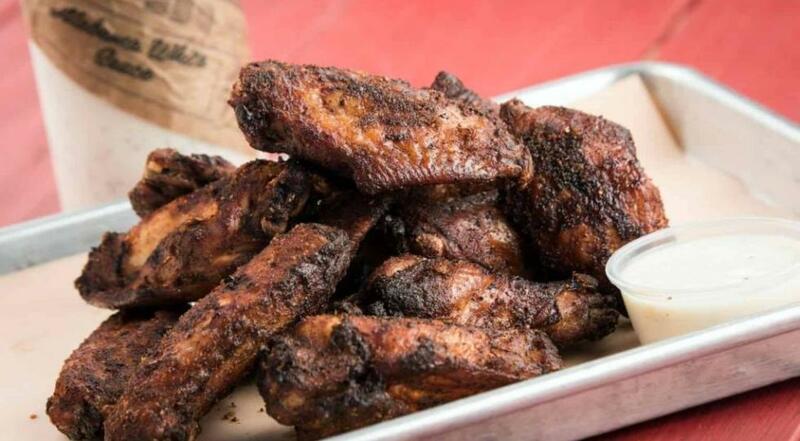 The Smoked Chicken Wings at Home Team BBQ in Charleston are legendary. Aaron Siegel, chef and co-founder of the popular local chain who we interviewed in this 2017 Conversations Around the Burn Barrel feature, shared his popular recipe with starchefs.com. In that piece, Siegel also reveals the recipe for Home Team’s Alabama White Sauce, which is the perfect companion to these wings. If you’d like to take your turn at making the perfect wing, here’s your recipe. 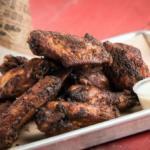 And don’t forget to make Home Team BBQ’s Alabama White Sauce to go with these amazing wings. In a large pot, bring water to a simmer and turn off heat. Add all ingredients and whisk until dissolved. Refrigerate until fully chilled. In the refrigerator, submerge chicken wings in brine for 4 hours. In a mixing bowl, combine all ingredients and stir till combined. Prepare a smoker with red oak and heat to 225°F. Remove Brined Chicken Wings from liquid and pat dry. Add chicken wings to a large mixing bowl and evenly distribute all but 4 tablespoons of Dry Rub. Smoke chicken 2 hours and 30 minutes. In a deep fryer, heat peanut oil to 350°F. Fry Smoked Chicken Wings 4 to 6 minutes, until crispy and just caramelized. Remove from fryer, shake off excess oil, and rest 30 seconds. In a mixing bowl, toss together wings and reserved Dry Rub. Awesome. I don’t think that is the article I saw. It was just the recipe itself. That’s an interesting and important step. Thanks for sharing! your recipe is missing a key step. The wings should be smoked in a hotel pan ….